My family love crepes, my family love crepes sprinkled with sugar and lemon. So when I made this for them, I knew they would love it. I have made this a few times now and it goes very quickly. I have yet to find someone who doesn't love it. Now, when I make crepes, I always make more than is needed, as my kids go through them like crazy, so the recipe may make more crepes than needed, but fill the extras with jam, nutella or lemon and sugar for breakfast or as a treat. The trick to crepes is if after you have made the crepe batter up and it has rested for 30 minutes, if it feels too thick, add a splash more milk to the batter. If it is too runny add more flour. When you pour the batter into your crepe pan it must glide smoothly, not be thick and slow, but not runny like water. I no longer even use a recipe to make crepes, as once you have made them often enough, it goes by feel. Also if you want more detailed crepe tips, go to my crepe recipe at www.whatscookingella.com/crepes.html for a more detailed explanation on crepe making. Now in this recipe I have introduced mineral water in the crepe batter, but you can just use 1 litre of milk if you like. You can use lite milk, full cream milk, a combo of full cream and skim milk, it really doesn't matter. If you don't have enough milk, you can add tap water. Crepe making is quite flexible in this regard. 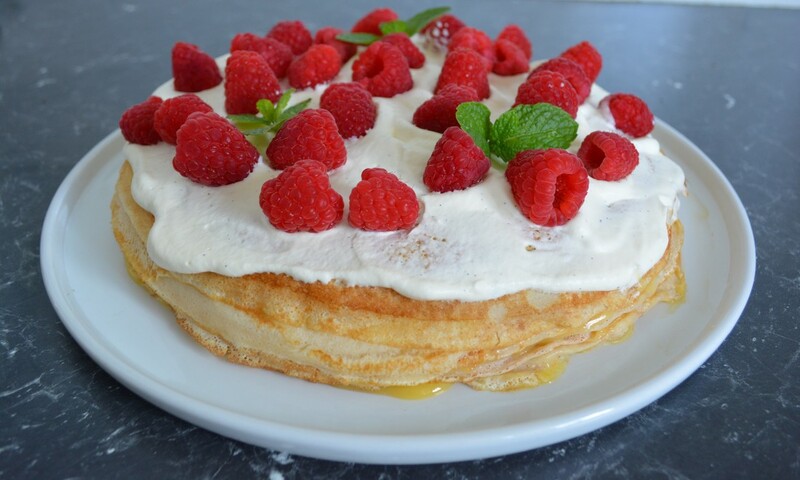 Sometimes I make this with my normal lemon curd recipe that has no gelatine in it, and it tastes great to. So if you have a favourite lemon curd recipe, it needs to be thickish, use it. But try this as it is a great way to end a meal, as it is refreshing and quite light. This recipe is best assembled a day before serving, it gives the curd enough time to set. You will need approximately 3 lemons for this recipe. Make the crepes: Place the eggs in a mixing bowl, add the flour. Add half of the milk; using a whisk, whisk until your mixture is lump free. Keep adding milk slowly until all the lumps have disappeared, then add remainder of milk and the mineral water, mix through. It is easier to get the lumps out, if the mixture is thick, so don't add all the milk in straight away. Leave to stand for 30 minutes. Strain the mix through a sieve to make them completely lump free-I however never do, more cleaning up, and a few tiny lumps don't make a difference. For me the first crepe is your tester, it rarely turns out great, as the pan is usually not hot enough. It is where you see if your mixture is too thick, if yes, add more milk, if it is too thin, add more flour, if your pan wasn't hot enough it will now heat up. The batter is only supposed to cover the base of the pan, so if you had too much mix with 3/4 of a ladle full, use less, or more if it wasn't enough-you can't have holes in your crepes. You need 12 crepes for this recipe. ​Make the Lemon Curd: Combine the rind, juice, sugar, strained egg and butter in a large heatproof bowl. Place the bowl over a large saucepan of simmering water (do not let the simmering water touch the base of the bowl), cook, stirring, about 15 minutes or until the lemon curd coats the back of a spoon. Remove from heat. Sprinkle gelatine over the water in a small heatproof bowl. Allow to sit for 5 minutes. Place the bowl over a small saucepan of simmering water. Stir until the gelatine dissolves. Stir the gelatine mixture into the warm lemon curd. Line the base and sides of a deep 20cm round cake pan with plastic wrap. I like to use a springform one, for easy removal, but you can use a normal cake tin. 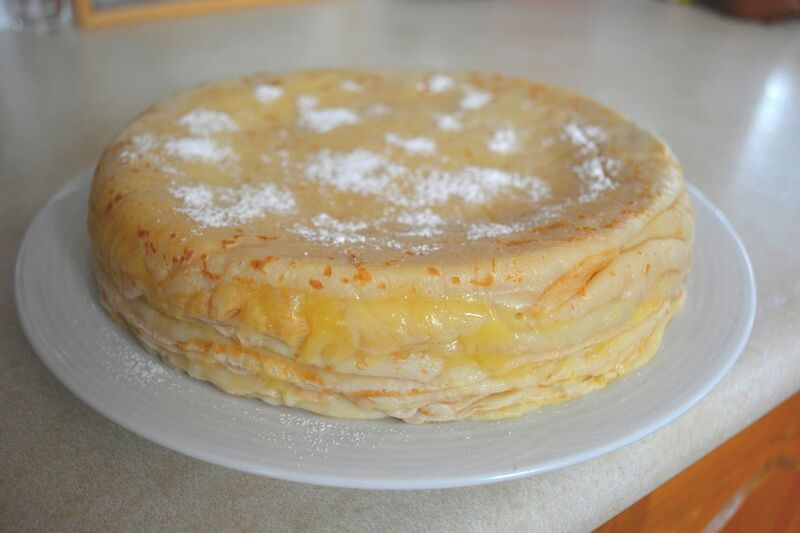 Place one crepe in the prepared pan, spread with 1/4 cup lemon curd. Continue layering with remaining crepes and curd, finishing with a crepe layer. Cover; refrigerate overnight, or until firm. Use the plastic wrap to pull the crepe cake out of the tin. Place on a serving plate. 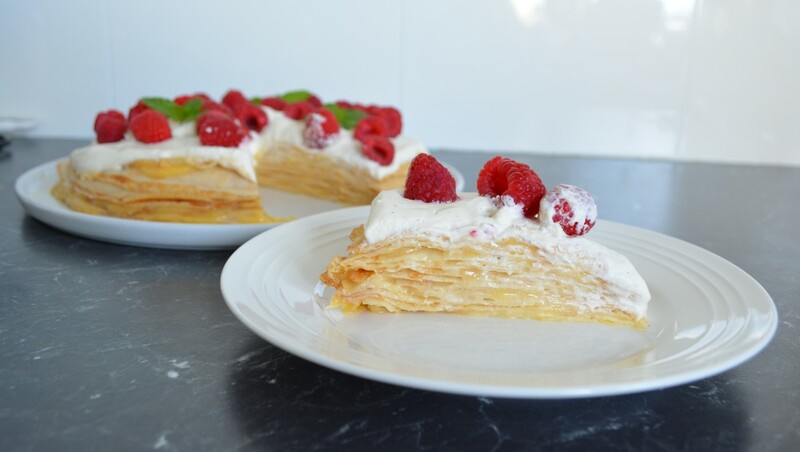 Serve with whipped cream and raspberries on top, or simply serve with some vanilla ice cream. Slice into wedges.